Taking the plunge to undergo hair transplant surgery can be a big step, but it’s one that an increasing number of individuals are opting for. Although it may feel like a major decision, the procedure itself is normally painless and without complications, being classified as only minimally invasive and low risk. However, unless you know what to expect, the recovery process can be somewhat surprising. Here’s a closer look at what happens following FUE hair transplant surgery. For the most cosmetically pleasing results we use the Follicular Hair Extraction technique – often abbreviated to FUE. FUE hair transplant surgery is amongst the most modern of techniques and delivers great results with the shortest recovery period. Unlike methods such as FUT (Follicular Unit Transplantation) there is no scarring and no need to worry about your scar showing following a visit to the barbers. With FUE, each follicle is removed individually or in natural clumps of 2 or 3 so there are a number of tiny incisions no more than a millimetre wide. In comparison a traditional FUT hair transplant surgery involves removing a donor strip from the back of the head and dividing it into individual follicles reading for transplantation. This leaves a linear scar and sutures using the trichophytic closure technique. During FUE short-lived local anaesthetics are used to minimise discomfort. A punch device removes the follicle; this is the most efficient process and also guarantees the least chance of visible scarring. The removed follicle is then placed in the bald area to create a natural effect. 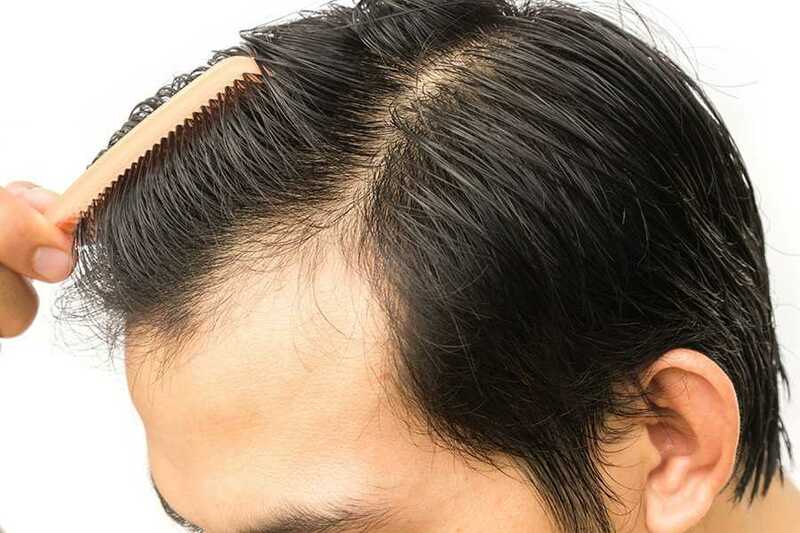 Although the technique reduces scarring and discomfort it is important to bear in mind that your follicles are being removed from one portion of your head and transplanted elsewhere, and there may be some temporary side effects which will diminish with time as the graft heals and establishes itself. You will be able to see the shape of your new hairline immediately after the FUE transplant has taken place with the follicles implanted in their new position. However, visually it may not be as pleasing as you may have expected as there will be scabbing around each follicle. As none of the incisions are more than a millimetre long the scabs will be small and quick to heal. Although the trauma to the donor site is minimal, there will be some side effects such as swelling. This is only temporary and will resolve within a matter of days. With certain other hair transplant techniques, such as FUT, there is a chance of developing numbness in the donor site. This is also temporary but can last several months before resolving. You may have some minor tenderness or soreness at the graft implantation site. Any swelling across the forehead will diminish within a few days and you will be able to resume your normal routine quickly. The surgeon will give you advice about how best to take care of your transplant to maximise the chances of a successful result. This might include elevating your head when sleeping and restrictions on washing your hair or showering. As long as you follow the surgeon’s recommendations the transplant will quickly settle down within 5-7 days. There’s no reason why you can’t go back to work straight away but realistically you may prefer to take around a week or so off. Exercise routines can also be restarted during this first week provided your surgeon does not advise otherwise. Around two weeks after your FUE surgery you may be horrified to discover your newly transplanted hairs are all falling out. Don’t worry, this is a normal part of the procedure and doesn’t mean that the grafts haven’t taken root. Hair grows from a follicle. When we talk about hair transplant what we really mean is follicle transplant. When the follicle is moved it temporarily ceases hair growth whilst it settles into its new location. The old hairs falling out are a natural and essential part of the life cycle and make way for new hairs to grow at the graft site. Hair only grows around 1cm per month, so it could take some time for your new hair to become visible and your hairline to start to resemble the result you were hoping for. After 4-5 months you should start to be getting a good idea of the final appearance, but it can take as long as 18 months for the full hair transplant to be visible. Depending on the time of year your transplant takes place (or your holiday plans), you may be advised to wear a hat or high factor sunscreen for the first few weeks. Once your new hairs have established themselves and are growing normally, you can treat your transplant area exactly the same as you would the rest of your follicles. You can have your hair trimmed within a month and after that, should you wish, you can dye it. A hair transplant is a permanent procedure and the results are lifelong. A year or two after the procedure is completed no one will be any the wiser that you have undergone a FUE procedure and you will not need to restrict your hairstyle choices in any way whatsoever. To stimulate hair growth after your FUE procedure we can offer Platelet Rich Plasma Therapy. It stimulates the hair follicles to regenerate and encourages hair growth. During PRP Therapy blood is taken from your arm and the naturally occurring plasma, where the platelets reside, is extracted in a centrifuge. This platelet rich plasma is then injected into the grafted area scalp where the hair is thinnest. Clinical data indicates that healing is encouraged by the release of cytokines and growth factors from the platelets into the injected area. We can also provide specialist follicle revitalising shampoos to reactivate the grafted follicles. Other treatments for thinning hair and hair loss such as laser therapy or vitamin therapy may also be offered to help your transplant establish itself and encourage the moved follicles to begin growing again. Ask your surgeon for further advice on which will be most appropriate in your particular case. An FUE hair transplant produces excellent, natural looking results and the recovery time is minimal and usually uncomplicated. Understanding what to expect can ensure there’s no panic when hairs fall out, or when it takes several months to get the glossy and thick head of hair you were hoping to achieve.